We are Peter and Judy Rosenstern, owners of the Star of Roses Organic Farm, located in Ahualoa on the Big Island of Hawaii. Our farm is certified organic by the Hawaii Bio-Organic Growers Association and specializes in medicinal and culinary herbs. We both have over 25 years experience in herbal studies. Our daughter, Lia, is a graduate of California School of Herbal Studies, founded by famed herbalist, Rosemary Gladstar. Lia is currently a consultant to our herbal preparations. All of our products are hand-made on our farm in small batches to ensure high quality, using our own herbs and the finest of ingredients. We make custom-blended teas, tinctures, herbal eye pillows, healing balms, infused oils, and skin care products, using the principles of aromatherapy and therapeutic herbalism. Since ancient times calendula flowers have been revered for their healing and nourishing qualities for the skin. Infused in extra virgin olive oil, also traditionally used for the same properties, calendula flowers contain lots of carotene and vitamin A, essential for healthy skin. We grow and process only the finest of organic calendula flowers and use them in many of our products. 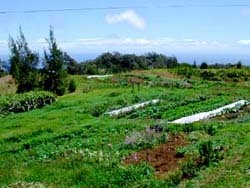 Star of Roses Organic Farm located in Ahualoa on the Hamakua Coast of the Big Island.